GEORGE W. MILLER. The subject of this sketch is a pleasant and progressive young merchant of Pierron, Bond County, Ill., where, if he has not yet become a millionaire, there are those who believe that he deserves such fortune, and are willing to predict a prosperous future for the original of this notice. Mr. Miller was born near Harrisburgh, Pa., September 11, 1853, and one of the solid old farmers of Dauphin County, of the same State, was his grandfather Miller. Some writers have declared that there is more peace and plenty to the square inch in portions of Southern Pennsylvania than in all of the Union put together, and perhaps the native Pennsylvanian thinks this true when a good case of homesickness overtakes him. At any rate, the grandparents of our subject did not care to change their lot, but the father of our Mr. Miller was in poor health, and in 1867 came West to try a change of climate. He settled in Wisetown, in this county, but died in 1883, at the age of sixty-nine years, having been a member of the denomination known as the ''Church of God." The mother of our subject was Elizabeth (Foose) Miller; she was a native of Pennsylvania, and is now living in Wisetown, in this county, at the advanced age of seventy-three years. She became the mother of five children: Andrew J., Katie, James D., Lizzie J. and George W. Our subject came here when he was thirteen years old, having attended the district schools of his native place when in the State of Pennsylvania, and was given eight months in the High School at Litchfield, Montgomery County, Ill. When nineteen years old our subject went to clerking in a store at Wisetown, and followed this occupation for ten years, in this time working at Wisetown, Greenville, Carlyle and Pana, thoroughly learning the mercantile trade. About this time he considered that he was well enough schooled in the business to embark for himself, and he went into partnership with U. B. Harris, The firm remained U. B. Harris & Co. for a space of three years, and at the end of that time our subject sold his interest there and came to Pierron, in 1885, and on September 14 opened a general store, which he continues to conduct at the same place. On November 3, 1885, Mr. Miller was married to Miss Mary Field, who was born in Waterloo, Monroe County, Ill., and three little children came to bless the home of our subject. They are: Malvern, Natalie and Urban. Natalie died October 1, 1892, at the age of almost four years. The business which Mr. Miller finds most profitable is a general stock. His goods are of the best kind and of the greatest variety, including dry goods, groceries, boots and shoes, furnishings and notions. He takes great pride in his business, as he has built it up himself, almost unaided, and from a beginning so small that it becomes unnecessary to mention it. Mr. Miller is a Democrat in his political faith. He was appointed under Garfield’s administration to be Postmaster, and held the position for two years, and was re-appointed in 1890 under President Harrison. He wished to resign this last spring, but so popular is he with all classes that he was not permitted to do so. As Justice of the Peace he has given good satisfaction for the past two years. The Independent Order of Odd Fellows claims him as a member in the lodge at Greenville. Probably there is no man of his age who is so popular in Pierron, and he has won this kind feeling by his genial manner and good judgment in his mingling with his fellow-men. 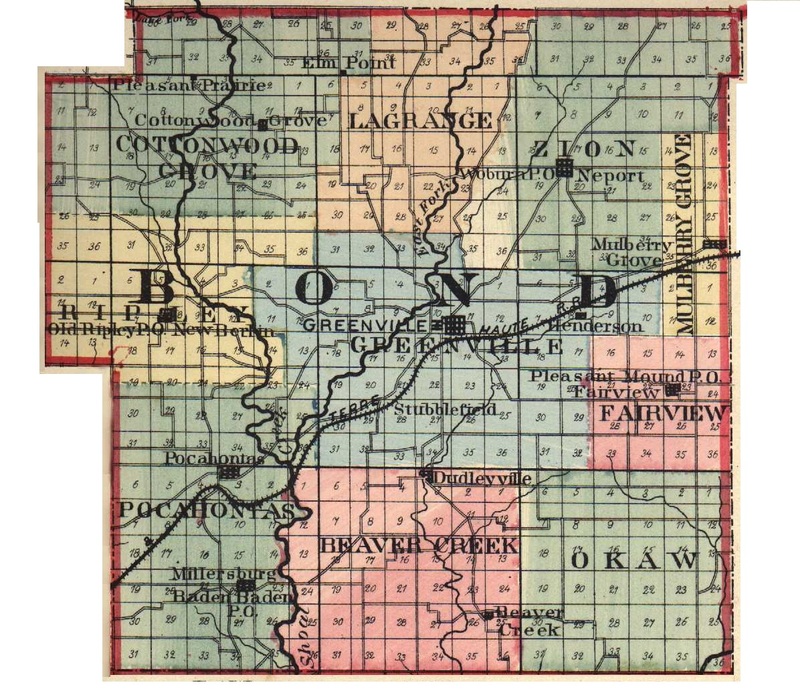 Extracted 21 Dec 2016 by Norma Hass from 1892 Portrait and Biographical Record of Montgomery and Bond Counties, Illinois, pages 480-483.